An analysis of change in the middle levels of the American class structure. 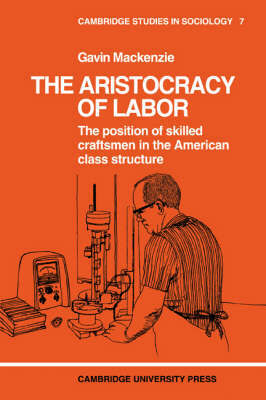 Dr Mackenzie's study is designed to test the common assertion in the press and in recent American academic sociology that the line separating the working class from the middle class is becoming increasingly blurred, leading to the embourgeoisement of large numbers of skilled blue-collar workers. In the course of his research he conducted intensive interviews with skilled craftsmen, routine white-collar workers and managers. (The latter were seen as being a middle class 'control group'.) The survey was carried out in Providence, Rhode Island. The author's central conclusion is that class barriers are not breaking down in American society at the present time - that large numbers of blue collar workers are not becoming absorbed into the middle class. Rather, it is suggested, craftsmen are in a class by themselves, isolated both from the traditional working class and the established middle class.